For the love of cheesy goodness, it’s National Grilled Cheese Day. Utah Valley has a variety of restaurants that have many delicious variations on the classic sandwich. 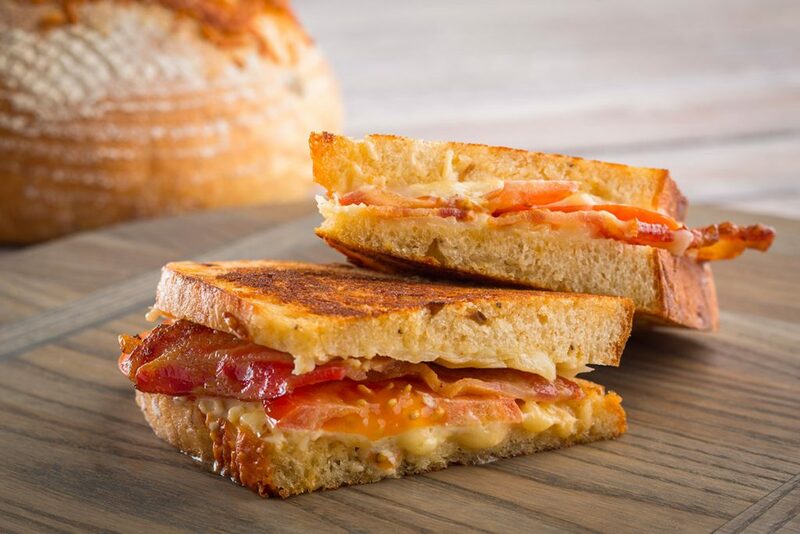 Cubby’s take cheese to the next level with its Three Cheese Grilled Cheese, which includes Swiss, cheddar and pepper jack cheese and is loaded with avocado, bacon and tomatoes. Shirley’s Bakery assures everyone it is alright to still like a childhood favorite with its Grown-up Grilled Cheese on French Bread, emphasis on the three cheeses. Then Cafe Zupas has the Ultimate Grilled Cheese that adds a finishing touch of a pesto spread. Kneaders also has its own muenster-sized twist on the grilled cheese — the Provolone-Muenster Cheese Melt — which Kneaders is offering for $5 on National Grilled Cheese Day. To receive the deal, customers need to follow Kneaders on Facebook and Instagram and show the promotion at the register. For when you don’t want to leave your house and a bland, cheddar cheese grilled cheese recipe doesn’t cut it, Kneaders shared a gourmet grilled cheese recipe. Yes, there’s bacon in it. Follow the recipe below. Lay bacon on sheet pan and roast for 25-30 minutes or until crispy and brown. Drain on paper towel. Combine mayonnaise, mustard, grated parmesan, salt and pepper. Arrange 12 slices of Kneaders Cheddar Garlic Bread on a pan and spread 6 slices with butter and 6 slices with mayonnaise sauce. On the sauce side of bread, distribute Gruyere and Cheddar cheeses. Place two slices of bacon on each sandwich and two slices of tomato. Top each sandwich with remaining slices of bread (spread side down). Heat large skillet on medium heat. Cook sandwiches for 3-5 minutes on each side until bread is browned and cheese is melted.